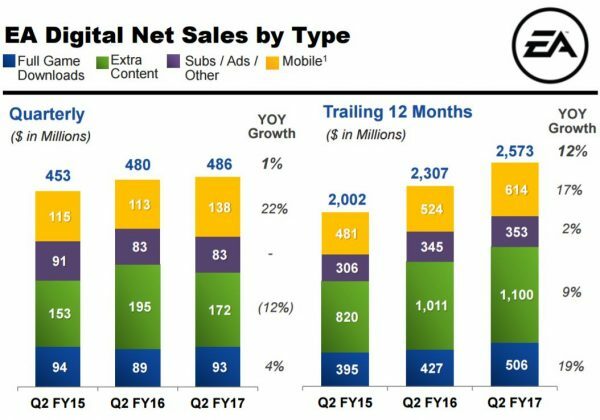 Over 43 million people played EA Sports and console and mobile games during the firm’s Q2 2017 financial reporting period, and folks are still playing mobile hit Star Wars Galaxy Heroes 2.5 hours per day. And Battlefield 1 content on YouTube was viewed over 100 million times from announcement to launch. Lordie that’s a lot. That’s according to an infographic released alongside the latest financial report, which you can look over in the gallery below. In the report, EA said the total Battlefield 1 player base during launch week was nearly double that of Battlefield 4, and continues to grow. In the first week of FIFA 17, 20% more players were engaged in the game compared to the first week of FIFA 16 last year and nearly 2/3 of all FIFA 17 players have engaged in “The Journey” story mode – and across 183 countries no less. Net sales from FIFA, Madden NFL and Hockey Ultimate Team are collectively up 15% for the trailing twelve months compared to last year. 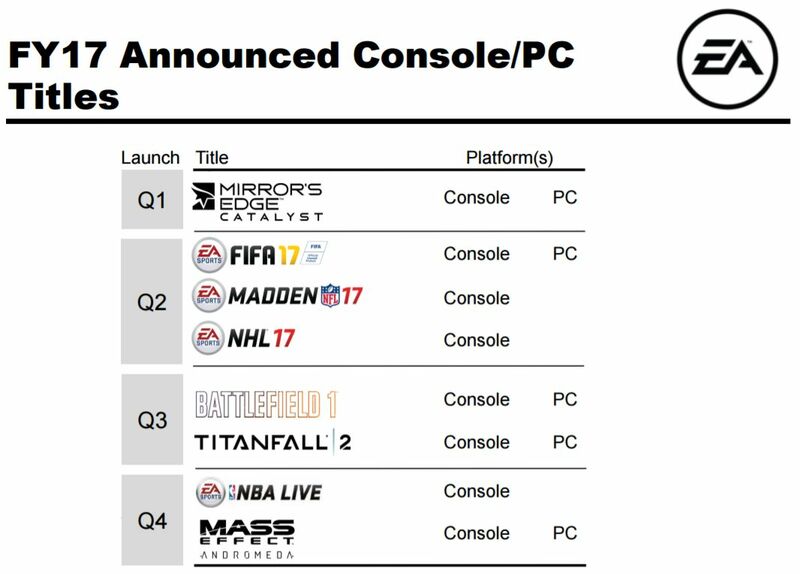 Actually figures on Battlefield 1 and Titanfall 2 were not provided, nor did EA discuss it during the call to investors. Titanfall 2 was released after the quarter ended, and results for FIFA 17 weren’t included in the report as it was released just four days before the reporting period ended. EA CEO Andrew Wilson said Titanfall 2 sales aren’t being cannibalized by Battlefield 1. The shooters are different, can both exist in the market, and are different enough to share retail shelves. The next Star Wars Battlefront game is still set for next year, and in fiscal 2018 the firm is hoping the Star Wars action title, which is the one said to be in the works with Amy Henig, will be released. The company is also excited about PlayStation 4 and Xbox One Scorpio, as they are a great options for consumers, according to CFO Blake Jorgensen. 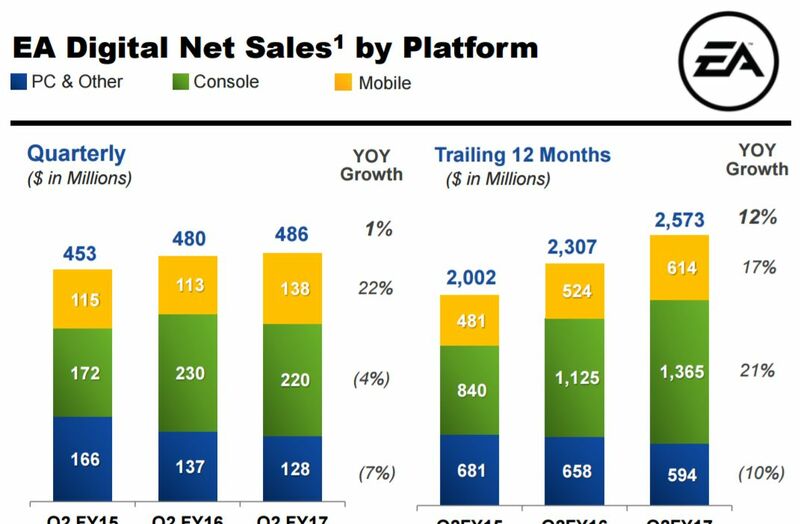 As it stands, according to his math, sales of current-gen consoles are 33% higher than previous generations, and as stated previously, they expect the install base to hit around 80 million by the end of 2016 and 100 million by the end of next year. 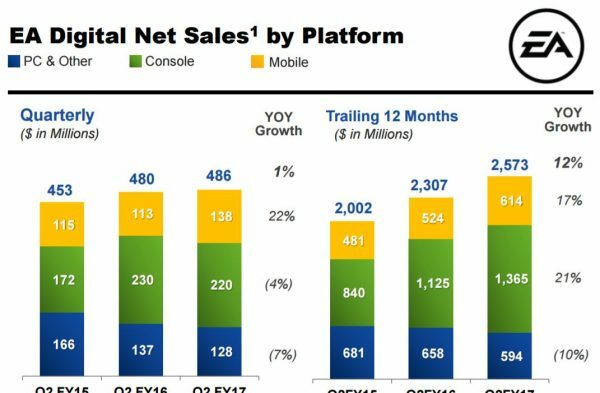 In March, Jorgensen said sales of current-generation consoles were around 60 million units combined for PlayStation 4 and Xbox One. PS4 sales currently stand at 47.4 million worldwide. Since Microsoft stopped providing Xbox One sales figures staring with its Q4 2014 report, unit sales for the console aren’t publicly known. The last figure provided was on December 3, 2014 during a shareholder presentation. The firm revealed the console had sold 10 million units worldwide. 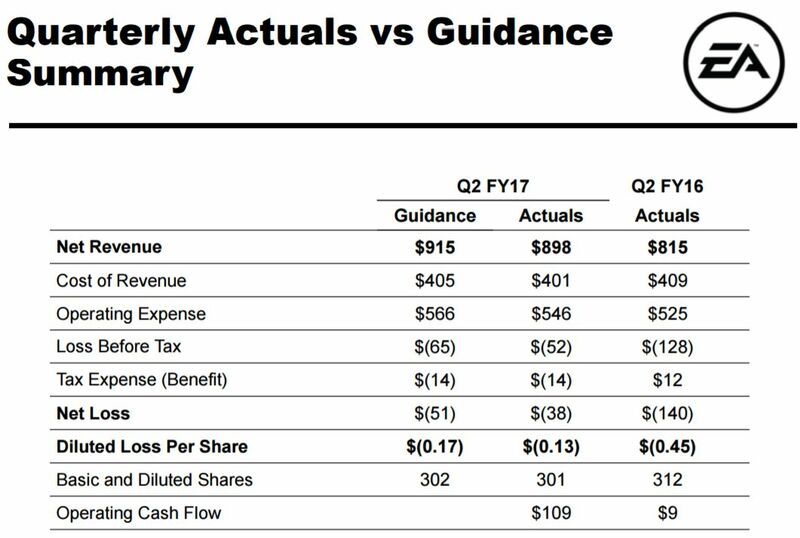 On the money end, net sales for the company for the trailing twelve-month period are up 8% year-over-year to $4.507 billion. For the quarter, net revenue was $898 million, and 63% of that was digital, or $566 million.